This weekend the K League Classic moves onto it’s third round of the 2015 season. A few sides have started the season well whilst others haven’t done quite so well. As mentioned last week this year there also won’t be able long breaks during the season so from now until November the K League will take center stage. The league table is still developing as only 2 games have been played so far. A few sides; Ulsan, Jeonbuk, Gwangju and Busan have started their seasons well. Whilst on the other hand; Incheon, Seongnam, Seoul and Daejeon haven’t done so well. 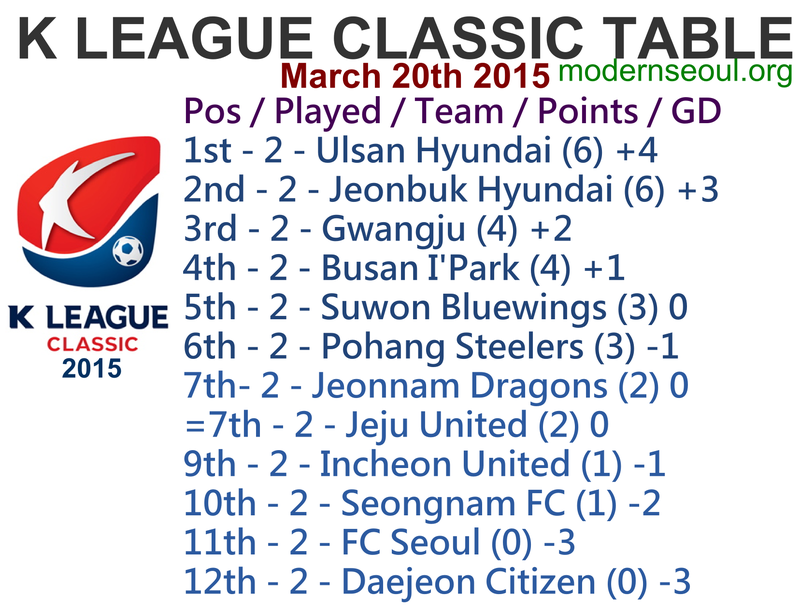 Saturdays first game features league leaders Ulsan Hyundai hosting Jeonnam Dragons. Ulsan Hyundai have a perfect record so far this season with 2 wins from 2 games. Jeonnam Dragons are currently undefeated with 2 draws from their 2 games. Ulsan Hyundai will come into this one favorites based on their previous 2 strong performances. 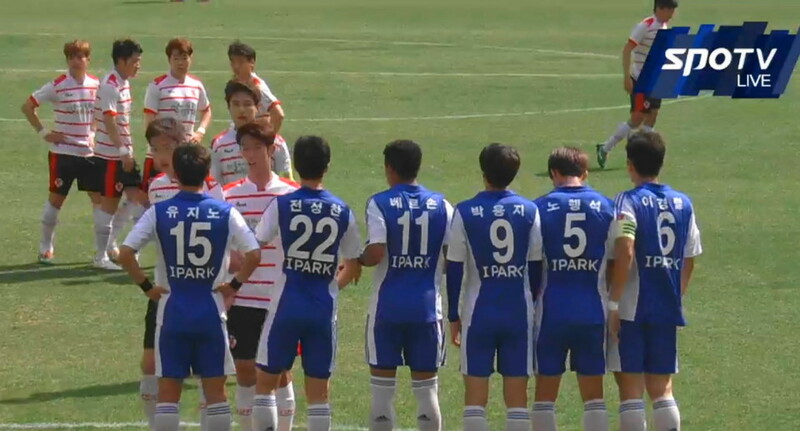 Saturdays 2nd game is between 2 surprise packages so far this season Busan I’Park and Gwangju. Busan I’Park have 4 points from their opening 2 games and have the leagues only 100% defensive record. Gwangju also have 4 points so far this season, and have only played away from home all season. This should be a close game and a draw seems the likely outcome. Saturdays late game features 2 sides still looking for a first win of the season with Jeju United hosting Daejeon Citizen. Jeju United have 2 draws from their opening 2 games. K League Challenge champions Daejeon Citizen have lost both of their games so far this season, and have also failed to score. Jeju United should have the slight edge at home, but this one will be close. Sundays first game features the 2 K League giants in Pohang Steelers and FC Seoul. Pohang Steelers so far have 1 win and 1 loss this season. But have played strong sides in Ulsan and Suwon so far. FC Seoul have lost both of their games this season and sit down in 11th. Park Cho-Young might be involved, but it still maybe a little too early. Pohang will be favorites in this one, FC Seoul really need to improve. Sundays second game features two local rivals in Seongnam FC and Suwon Bluewings. Seongnam FC have a single point from their 2 games so far this season, and have failed to score as well. Suwon have one win and one defeat so far, and scored in the dieing moments to win last week vs. Incheon United. We see Suwon edging this one, but it will be close. Sundays late game features at either end of the table, Incheon United and Jeonbuk Hyundai. Incheon United have twice conceded late to throw away points so far this season. Jeonbuk Hyundai currently are undefeated after beating FC Seoul and Seongnam FC. Incheon at home are generally good, however Jeonbuk might be a little too much here. 3 correct results, but no perfect scores. The new K League Challenge season start this weekend, here is the K League Challenge 2015 Round 1 Preview, Predictions and Results.